Summer should be a time of family fun but for some, the costs of that family fun can make or break your summer vacation. All of those “fun” places that our kids seem to want to visit can cost hundreds or even thousands of dollars. Having a great summer that is packed with fun activities doesn’t have to be a budget busting experience though. 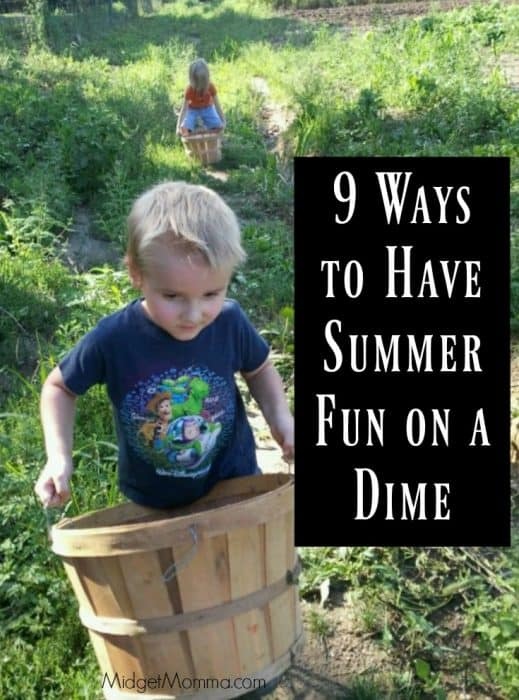 These 9 ways to have summer fun on a dime are all great ideas and are budget friendly enough that you won’t go broke! Also don’t miss the Barnes and Nobles Summer Reading program where kids can get FREE Books and the Kids bowl FREE Program – the kids can bowl for FREE all summer long! And if you are looking for more summer fun ideas Make sure you also check out the 100+ Fun things to do with kids this summer. Make sure you also check out the Regal Cinemas Summer $1 Movies and the 50¢ Cinemax Summer Movies. Go camping – Grab your tent and head out to the woods! Camping is a fairly budget friendly family activity so make sure that you add it to your summer fun list! Most state and national parks offer camp sites for a reasonable per night or week price meaning you can make it a long term camping trip if you want! Just be sure to pack the graham crackers and marshmallows for s’mores! Visit the local parks – Along the same lines as camping, why not make a day out of spending time at your local parks? You can pack a picnic lunch for cheap then spend the day just letting the kids run around. Depending on where you live, your local parks might even have hiking trails too! Ride Bikes – Dust off your old 10-speed and hit the pavement for a free summer fun idea! Your kids will enjoy that you’re riding with them and you’ll end up just a tad bit healthier than you were before the ride. Plus, you never know what you might see. Make it even more fun for the kids by having them spot things along your ride that you call out! It’s a mobile scavenger hunt! Use a Groupon – For things that do cost money, Groupon is a great option for helping you save on summer activities. Generally, you can save between 30 and 50% on admission prices. Depending on the price, this may cut your cost down enough that you can even add an extra stop or meal along the way! Visit museums – Museums are a great addition to your summer fun list for a couple of different reasons. First, they’re usually very cheap to get into. Sure there are exceptions but for the most part, you’ll find them affordable. Secondly, your kids will learn while they’re having fun. It doesn’t get much better than that for parents! Take a Day Trip – Pile everyone in the car, pack some snacks and just drive. You never know what you’ll come across and the total cost? Only the tank of gas. If you really want to make it fun, make an I-spy list before you leave the house and see if the kids can spot all of the items on it while you’re driving! Hit the pool – If your city has a city pool, hit it up for some budget friendly summer fun! Admission is usually only a few dollars per person and lasts the whole day. Your kids will have a blast playing in the water and you’ll love the fact that it was so cheap to do. Just be sure you don’t forget sunscreen. No one likes a sunburn! Go Fishing – Finally, grab your fishing poles and swing by the bait store and head out to see what you can catch. Fishing is not only fun but it also a great way to save on your food bills! Just be sure that the lake you’re fishing in is clean if you plan to eat your catches. Otherwise, throw them back. Go Fruit and Veggie Picking – Use Pick Your Own to find a local place near you to go and pick your own fresh fruits and veggies. Not only is it fun but then you also have lots of fresh produce and its cheaper then buying it at the store! See? Having family fun this summer on a budget doesn’t have to be hard. You just have to get creative and put your thinking cap on! Do you have any other ideas for summer fun on a budget? I’d love to hear them! I think the bowling is a great thing! But nothing near me? Depending on where you live and the prices of gas and mileage per gallon your car gets a random aimless drive to see where you end up “only costs a tank of gas” is not so cheap A tank of gas for our car is 50$ 60 for my dad’s plymouth mini van. I would rather buy gorceries, or go out to eat, than waste 50-6o$ on a destinationless drive to see what we discover.